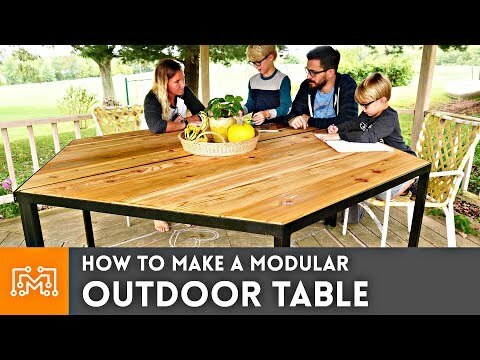 I made a modular hexagonal table for our gazebo! Get your first audiobook for free when you try Audible for 30 days visit https://www.audible.com/makestuff or text makestuff to 500 500! This project began with a call to my local steel yard. I was pretty intimidated when I called because I don't really understand the terminology and didn't want to sound dumb to a bunch of steel workers. To my surprise, the guys were super helpful and patient when taking my order, and even offered to deliver the steel to my house! I took the 1 1/2" square legs we cut earlier and welded them to the 4 corners of each table half. I aligned the sides with the faces that you would typically see when sitting down. After tacking them in place, I laid down some final welds. Just like the top frames, I ground and sanded the joints smooth in preparation for paint. I chose to paint the tables bases with some black enamel spray paint. Powder coating would be more durable in the long run, but I don't have an oven big enough to bake the entire table. Each metal base got two coats of enamel, and they really looked great. Because I am painting the frame, even with more durable enamel, the frame can be scratched and the metal can show through. We have to watch out for any abrasions so that the exposed steel frame doesn't start to rust. Because I wanted an 1/8" reveal between the table top and the base, I used the circular saw to make one final cleanup cut on the angled sides. This cut gave me the 1/8' gap on the outsides and a consistent spacing all the way around. The table tops were secured to the base with some stainless steel screws to prevent corrosion.